I haven’t posted any wines for a while. I’ve had several, but just haven’t had the time to photograph and review them. But these two were standouts so I’m back to describe them. 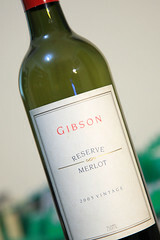 The 2005 Reserve Merlot from Gibson is a blend of two Merlot crops, from the Adelaide Hills and Barossa Valley, both in South Australia, with a total of 15% of Cabernet Sauvignon added in, also from both locations. Apparently this is little enough that it doesn’t need to be mentioned on the front label. Anyway, we had this wine at a Thai restaurant, with grilled salmon, and a beef pad khee mao – flavourful but neither dish very spicy. From the first sip I knew this was something special. It’s very complex, bursting with layers of different flavours that it took me some time to get to grips with. Wife held the back label of the bottle secret and we tried to list some flavours. I got an aroma of raspberry – it smells very fruity and simple. But the flavour is big and round and fills the mouth, with black cherry dominant to my tongue. There’s no hint of the mint you sometimes get with Merlot, but more of a dark fruit thing, with a subtle hint of cinnamon and maybe nutmeg. A light touch of oak comes through and some light tannin. And then the most extraordinary thing happens – the aftertaste is long and lingering, and both wife and myself picked up a creamy, milky sensation. After this, we referred to the back of the bottle, which listed stone fruits, musk, cinnamon, and almond. The milkiness clicked with the almond – a definite link there. Overall it was very pleasant and interesting, and it matched the food tolerably well, so a definite success. And ever since I started getting into wine, I’ve been keen on trying some of the more exotic sweet offerings. 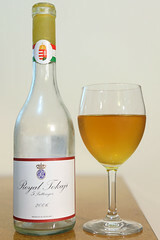 I’d read about Hungarian Tokaji, but had never seen any in a local shop. Then when I went to San Francisco recently, I happened on a wine shop in Burlingame, and browsed around. When I spotted this bottle of Tokaji, I had to buy it. It survived the trip home in my luggage, and we cracked it the other day after dinner. It’s really different to any other dessert wine I’ve tried. Most are sweet, tending to syrupy, with orange and marmalade notes dominating. This one is much more tropical in outlook, with a bright golden yellow colour, and a thin-ness that is far from syrupy in the glass. It smells fresh and clean, fruity, with perhaps a hint of freshly cut grass. The taste is liquid sunshine, with pineapple coming through strongly, and hints of kiwifruit and lime. There’s a minerally, chemically mid-taste, slightly reminiscent of Riesling. Some dessert wines retain residual fermentation fizz, but there’s absolutely none here. The aftertaste is smooth and lingering, tending towards banana. It’s totally different to any other dessert wine I’ve tried, and very nice. I must keep an eye out for more. This entry was posted on Friday, 25 March, 2011 at 21:59	and is filed under Wine. You can follow any responses to this entry through the RSS 2.0 feed. You can skip to the end and leave a response. Pinging is currently not allowed.